DeRouchie, Jason. How to Understand and Apply the Old Testament: Twelve Steps from Exegesis to Theology. Phillipsburg, NJ: P&R Publishing, 2017, pp. 640, $39.99, hardback. While there are many introductory books on the Old Testament (OT), there are few which walk both beginning and advanced students together through each step of the exegetical process leading into theology and application. 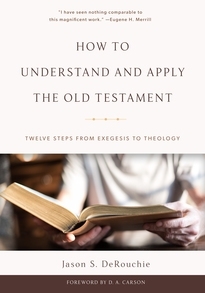 Jason DeRouchie does just that in How to Understand and Apply the Old Testament: Twelve Steps from Exegesis to Theology. The book lays out a step-by-step guide to OT Exegesis intended to be accessible, yet complete. DeRouchie currently serves as an elder of Bethlehem Baptist Church, is Professor of OT and biblical theology at Bethlehem College & Seminary and received his Ph.D. from The Southern Baptist Theological Seminary. DeRouchie has published and contributed to other books on the OT including What the Old Testament Authors Really Cared About: A Survey of Jesus’ Bible. He has also recently published an elementary Hebrew Grammar with Duane Garrett titled A Modern Grammar for Biblical Hebrew. The stated goal of the book is to provide a twelve-step guide to interpreting the OT, with a focus on textual analysis, synthesis, and significance. DeRouchie guides his readers from the foundational elements of genre, literary units, and translation concerns (part one), through text grammar and analysis (part two), context (part three), into biblical, systematic, and practical theology (parts four and five). After his introduction, DeRouchie begins with step one on evaluating genre and understanding how it effects hermeneutical methodology. In step two he gives an initial demonstration of the tracing and diagramming method for bringing forth the natural divisions in the text. Steps three and four on text criticism and translation provide detailed information on each discipline alongside of practical methodology. These chapters begin with basic elementary principles and then transition into the fields of Hebrew textual criticism and translation work respectively. Steps five to seven provide the grammatical and syntactical meat of the book. Step five begins by defining grammatical terms, examining the use of various verb conjugations, and surveying markers of immediate significance and inference markers. From there, DeRouchie quickly broadens out into clause grammar and steps back further in step six of the exegetical process: argument tracing. Building on the previous steps, DeRouchie guides the reader through the process of deciphering the literary argument, creating an argument diagram, and drafting an exegetical outline. Step seven provides a guide to doing Hebrew word and concept studies, even for those without training in Hebrew. In the next two steps, DeRouchie introduces how historical and literary context fits into the exegetical process by asking and answering the right questions. Steps ten and eleven define biblical and systematic theology, unpacking the use of these disciplines in the exegetical process. The final step dives into practical theology or how Christians should relate to, apply, and teach the OT. DeRouchie has here provided a one of a kind work which efficiently unites grammatical and hermeneutical principles, generally learned from a Hebrew grammar and a hermeneutics book respectively, with exegetical practice. The uniting of these preeminent, seemingly abstract principles, with his steps of OT exegesis allow this one book to do the work of three. DeRouchie does all this while remaining accessible overall to those with little to no knowledge of Hebrew. This is possible through the labeling of each section under an “easy,” “moderate,” and “challenging” tract heading. In the preface, DeRouchie says, “two of the distinctive contributions of this book are its focus on discourse analysis and biblical theology.” (p. xxiv). Regarding biblical theology, step ten does present a well-developed and thoroughgoing introduction to biblical theology. Furthermore, the “kingdom” acronym which he has created for tracing redemptive history and visualizing salvation-history connections (p. 353) provides a stellar redemptive history overview. Yet even with these, DeRouchie’s section on biblical theology, while important and informed, provides only a minimal contribution to those who are already acquainted with biblical theology. Furthermore, some will find this chapter’s progression of topics hard to follow, making future reference difficult and less fruitful than other resources on biblical theology. On the other hand, steps two, five, and six of the exegetical process dealing with literary units and text hierarchy, clause and text grammar, and argument-tracing, make DeRouchie’s guide to OT exegesis stand out among similar books. Through these chapters, he manages to skillfully guide Hebrew students, both experienced and inexperienced, through the rugged terrain of exegesis (including the difficult work of lexical study and syntax) to the refreshing landscape of application. In so doing, the reader is equipped with the tools and skills necessary to take the text at face value and see its relevance for practical life. After carefully reading and implementing the steps outlined in this central section, the intermediate Hebrew student will be well on his way to faithful Hebrew exegesis. These distinctive chapters in the book will supply readers with the tools needed to form an accurate text hierarchy by laying out the clauses and using the features of Hebrew text and clause grammar to trace the argument of the biblical author. Each of the steps presented in the book contribute to or flow out of this central grammatical process, making the strength of these sections invaluable to those seeking to better understand and apply the OT. Students of the Bible can benefit from simply becoming familiar with the twelve chapter-titles (twelve steps) of the book found in the table of contents (p. vii). These twelve steps are practically identical to what is presented by Douglas Stuart in Old Testament Exegesis: A Handbook for Students and Pastors, furnishing the student, pastor, teacher, and scholar with a tried and true process for faithfully laboring in the Scriptures. After this, the difficulty headings will guide the reader to those parts of the book which are accessible to them depending on their level of Hebrew. DeRouchie will be especially helpful to students transitioning from elementary Hebrew classes into intermediate and advanced exegetical study of the Hebrew Bible. Even so, readers with little to no knowledge of Hebrew will find most of the book refreshingly accessible. Those only reading “easy” and “moderate” sections of the book are encouraged to journey through an Elementary Hebrew grammar such as A Modern Grammar for Biblical Hebrew by Duane Garrett and DeRouchie, so they may go back to read the “difficult” sections. While many books on the OT inform readers about what the OT says, DeRouchie takes the time to show readers how to study it for themselves. As a comprehensive guide to studying the OT from exegesis to theology designed for beginning, intermediate, and advanced students of the Bible, How to Understand and Apply the Old Testament is a truly unique and invaluable resource.